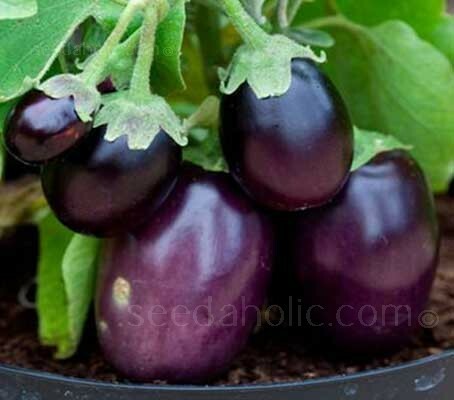 Aubergine 'Kaberi F1' is a small fruited, compact bush variety of aubergine. It is a unique variety bred specifically for container production and a worthy successor to Baby Belle. Its compact habit makes it a perfect choice for mixed flower and vegetable planters. Traditional eggplants can be tall and require staking and are difficult to handle at times as they are thorny. 'F1 Kaberi' stays compact, does not require staking and is thornless unless stressed, making it much easier to handle and harvest. These smaller fruited varieties are easily grown in containers. Make sure your container is large enough and keep it well watered. In cooler climates, growing aubergines in containers is a good option as they can be moved to a protected spot whenever a cold spell threatens. 'Kaberi F1' forms an abundance dark purple-black, small-sized, oval-round fruits. Typically 50 to 60 grams in weight they are at their best when harvested when the fruits are small, just slightly bigger than an egg. The plants are compact and are well suited to growing in containers or in open ground in a warm sunny location, they will grow easily in a greenhouse or tunnel. The beautiful purple-black oval-round fruits mature in just 60 to 65 days from transplant and can be harvested from August onwards.